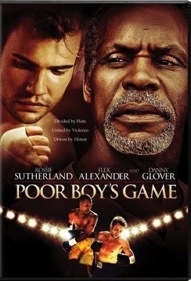 Released from jail nine years after leaving a boxing opponent with permanent brain damage, Donnie (Rossif Sutherland) conceals the profound changes he experienced behind bars while preparing to defend himself against an angry young boxer determined to face Donnie in the ring. Remarkably, it is the father (Danny Glover) of the man Donnie crippled who comes to his aid. The movie is set in Halifax, in a run-down part of an economically depressed city (and region). How does this setting set the tone for the movie? Why were there so many important scenes at the old battlement complex by the ocean? Why does George take Charlie out of the room when the fight video is on TV or when Ossie preaches? Why did Charles enter the ring at the end of the boxing match? How would you describe the relationship between Donnie and his brother Keith? How do you explain their very different responses to the past? Why do you think George asks his friend, the white gym owner, to train Donnie? Compare Donnie’s motivation to fight with George’s motivation to support him. Why did Donnie leave boxing behind at the end? Why do you think the movie is called Poor Boy’s Game? What is the significance of the book that George reads with Charlie (Great Expectations by Charles Dickens)? Why does his mother, Ruth, object? Why is Charlie drawn to that particular book? George, Ruth (Charlie’s parents) and Ossie Paris (the fighter) were all very personally affected by what happened to Charlie. How do you explain their differing responses? How is this movie similar to, and different from, Do The Right Thing? Compare the “punchline” of both movies or the different impressions they make on you. The preacher quotes a section of Jeremiah 51:56, which refers to a time when Israel was oppressed during the Babylonian exile. How is this text interpreted (or misintepreted) in this scene? How do you deal with your own anger? Have you ever had to confront someone who’s wronged you? Did you side with mercy or vengeance? The movie speaks to the need for us to come to terms with our own unconscious anger, passed on to us by our parents and culture of origin. What message did you hear? Ossie said from the pulpit that the boxing match was a forum to allow him to share God's gift with others. Yet later you realize there are other motivations involved as well. What were they? What can we do when we realize that we have mixed motivations for our actions?